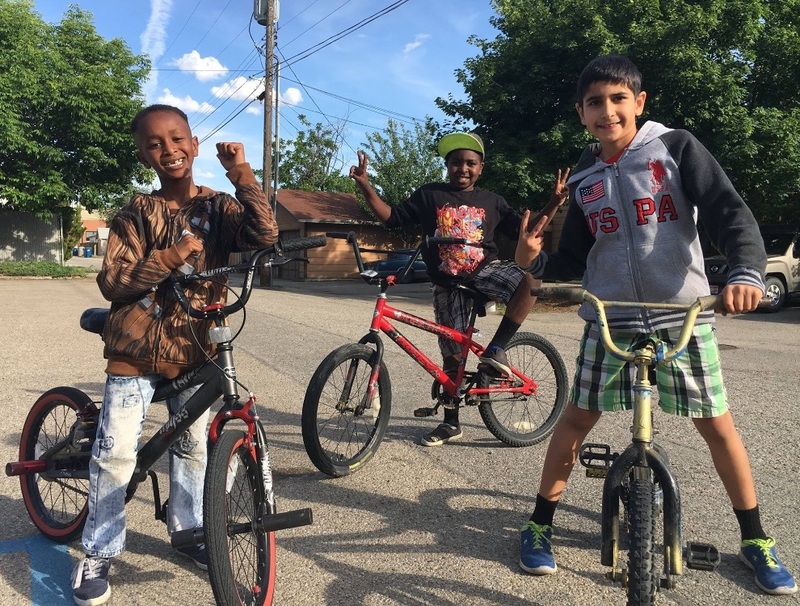 Meet the Spicy Riderz, the Boise Bicycle Project’s self-named Youth Opportunity Team. These particular three have received at least 3 bikes each from our programs in the last 6 years, they’ve become staples at the shop, and what’s really exciting is the journey unfolding in front of them/us (OUR COMMUNITY) tomorrow. “Two! Four! Six! Eight! Idaho’s too great for hate! “Say it loud! Say it clear! Refugees are welcome here! From the sidewalk I could see Ashilo’s neon green beanie bobbing up and down in the middle of the group. “Heck Yah!” I said out loud, and quickly squeezed through crowd to catch him. He turned around with a big smile, “Hey Jimmy! Where’s Ned?” (Ned is beloved BBP’s shop dog). Ashilo, his older sister, and several of his classmates from Garfield Elementary had ridden a school bus to BSU for the Martin Luther King Jr. Day March and Rally. They had arrived early to create hand drawn signs with magic markers and paint. Someone must have came prepared for the wind, because there was more than an abundance of duct tape on attaching the back of each sign to its supportive stick. Those were the messages Ashilo, Sahrenna, and Sabinae carried on their signs as they marched toward the Capitol. As I walked along side, I couldn’t help but think how different their story was/is than mine. Over the last several years I’ve gotten to know each of these kids, and I’ve had the privilege to witness the impact BBP’s bicycles have made in their lives. When I see the freedom and opportunity their bicycles have created, I am reminded of my own youth and my own journey, but the words on those signs and the words being chanted “…refugees are welcome here,” impact them in a very different and very direct way that I will never fully understand. The situation I was born into means I will never face the same barriers they’re confronted with every day. Their perspective is one that I will never truly experience. There is opportunity captured in these photos, opportunity to a create a future brighter and stronger than Boise has ever seen, but only if that future includes an opportunity, a path, for these kids to be sitting at the planning and decision making table. Why? Because knowledge, hope, innovation, and strength are created through diversity of thought and shared understanding of the vast human experience. There is opportunity in these photos, but only if we, as a community, seek to understand it, demand it, and get involved in opening the door. Subject Line: I want to get involved, but am not sure of the most effective way. Can you help? Please take the first step in getting involved with BBP or another nonprofit trying to build a brighter future for our community. I you can take that step, our job is to provide a pathway for you to take the next and the next. And then the journey begins. Thanks you for riding with BBP and with these kids! What do emergency service technologies and bikes have in common?